This "Historically Speaking" column was published in the Exeter News-Letter on Friday, August 14, 2015. Courtesy of the Portsmouth Public Library. “The opportunity to see the Spanish prisoners on Seavey’s island will not last much longer, and all those who have not done so, should be sure and make the trip.” Wait, what? This little notice published on August 19, 1898, in the Exeter Gazette immediately piques one’s curiosity. Why were there Spanish prisoners in Portsmouth harbor and why on earth would they be treated as a tourist attraction? That summer, in 1898, the United States was fighting the Spanish American war – a three and a half month engagement that John Hay, serving as ambassador in London, would famously describe as, “a splendid little war.” Ostensibly fought to help Cuba gain independence from Spain, the United States had entered the fray after the battleship USS Maine had exploded in Havana harbor the previous February. The cause of the explosion has never been definitively proved, but the loss of 266 US sailors was enough to prompt President McKinley to press for a declaration of war. The war began in late April and on July 3rd the Spanish navy was essentially destroyed during the battle of Santiago de Cuba. The defeat left nearly two thousand Spanish sailors captives of the United States and a decision was made to transport and imprison them on Seavey’s Island. Why so far? Most likely it was to remove them entirely from the field of action and to house them someplace with a healthier environment – away from the yellow fever and malaria of Cuba. The big naval prison -- known as the ‘castle’ by most of us -- wasn’t built yet in 1898. In order to house the prisoners barracks had to be erected quickly on the island. 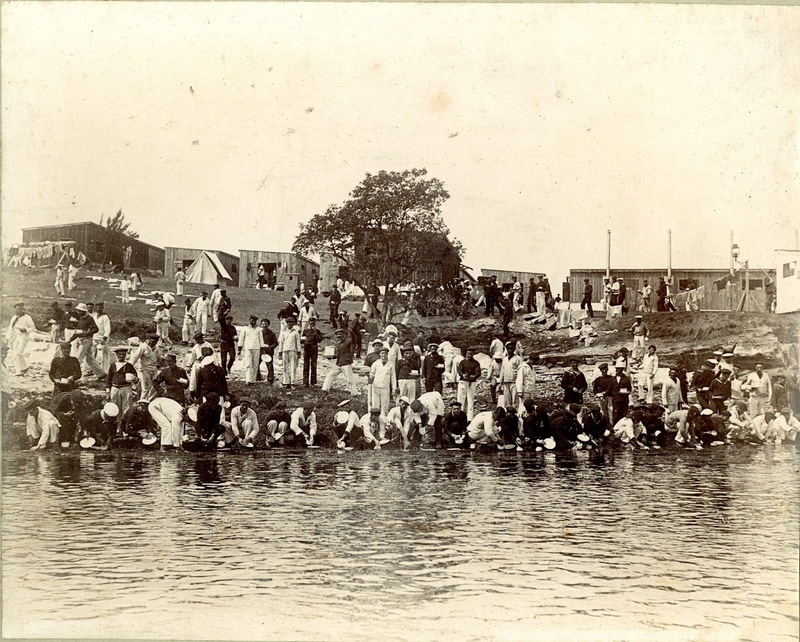 Eight large sleeping quarters, six cook houses, three mess halls, two wash houses (one of which was reserved for officers) and one toilet facility were hammered together by an army of carpenters in two weeks. The first of two cruisers, the St. Louis, arrived in Portsmouth harbor on July 10th with 746 prisoners on board. The Exeter News-Letter reported, “the prisoners on the lower decks of the ship, many of whom thrust their heads out of the ports to look in astonishment at the animated boatloads of ‘Americanos’ who swarmed around the St. Louis,” were, “pale and plainly wanting the stamina that good food gives men, these prisoners were a strange-looking lot of seamen to the eyes of New Englanders, accustomed to associate brawn and tan with men of the sea.” The accounts of the prisoners took on an almost anthropological tone, as if these strange foreigners were from another planet instead of Spain. “There were no smiles on the faces of the young officers, some of whom bore the unmistakable stamp of gentle blood. All were bearded, with pointed mustaches and small vandykes. All had the almost effeminate bearing of the gentler mold of men in the Latin races.” Oh, dear. Is it any wonder that they would attract curious visitors eager to quell the mid-summer slump as a looky loo? Two Exeter businessmen, Rufus Elwell and John Fellows, managed to make a visit to the St. Louis and after Admiral Cervera made a small purchase from a Portsmouth merchant, quickly bought the Spanish coins he used as payment. Described by the News-Letter as “valuable souvenirs of the war with Spain in the shape of 25 peseta gold pieces from the personal funds of Admiral Cervera himself” they were eager to show them off to anyone who might ask. 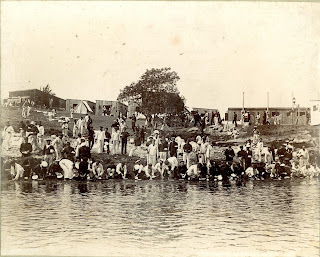 The prisoners remained at Seavey’s island until September 12, when they returned to Spain on the Steamer City of Rome. In total, 1562 prisoners served time in Portsmouth harbor, 31 died of injuries or illness contracted while in Cuba. These men were buried on the island, but were repatriated with great honor in April of 1916. Their departure coincided with the end of the summer tourist season, and voyeurs turned out to watch the big steamer depart. “As she passed down the harbor on her way to the sea, the spectators on small craft and on shore renewed their cheer, and the steam vessels blew their whistles for several minutes.” It was the end of a seeming small war, one that brought the United States into the international theater. What they couldn’t be aware of yet was that this ‘splendid little war’ would lure the nation into a quagmire in the Philippines that would last years. Image: Courtesy of the Portsmouth Public Library. Prisoners from the Spanish American war were held at Seavey’s Island in Portsmouth harbor from July to September 1898. Seen here washing dishes, the prisoners became a tourist attraction to local visitors.